When pulling together the shapes and lines that make up a composition it can be challenging to determine how much information is enough. Some of my favorite drawings and paintings exhibit a very economical approach to line, saying just enough to let the viewer see what the artist sees. In recent weeks, I’ve been doing many gesture drawings, as I’ve mentioned before, and I’m trying to let my paintings be, somewhat, more gestural. I started my painting today outside with lots of light and finished it at home by bumping up the shadows and contrast. I’m really trying to stop myself from overworking each painting and I’m pretty happy with how this one looks. If you have the time, let me know what you think. 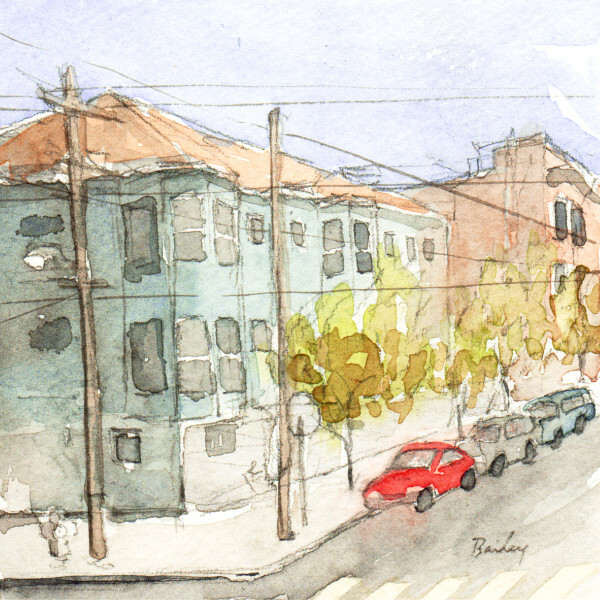 This entry was posted in Watercolor and tagged Art, Creativity, Daily Blog, Daily Journal, Drawing, Outdoors, San Francisco, San Francisco Art, Watercolor, Watercolor Painting by theartofbrian. Bookmark the permalink. I think less is more. I like it. Wow, I’m looking at the size 4″ x 4″ – is this in a journal? Kind of a mini. In my opinion, I’d have left out the left side of the building, extreme left of the frame – but kept the pole and sort of maybe not colored that in/painted it. That’s being really minimal! But I love the gesture in the trees and in the lines extreme upper right of the buildings. I feel that. Great!!! Mission accomplished. Thank you! Yes these have been very small, not in a bound journal though. Actually, I’ve just been thinking that I’m going to post some bigger paintings soon. This is great! The picture has depth to it, love the detail.